Happy Birthday (Vyasa Puja) to Bhaktimarga Swami! ~ The Toronto Hare Krishna Temple! Happy Birthday (Vyasa Puja) to Bhaktimarga Swami! Today, October 5th, marks the birthday (what we often say as "Appearance Day") of our very own HH Bhaktimarga Swami! As many of our regular temple-goers know, Bhaktimarga Swami serves as Co-GBC (Governing Body Commissioner) for our Canadian Hare Krishna temples. This means that he helps guide the spiritual course for our Canadian temples and their respective communities. Known for his amiable personality, humble disposition and incredibly artistic nature, Maharaj is at the very heart of so many giant projects across our country. Our Toronto temple's vibrant community, innovative outreach and fledgling congregation are certainly attributable to our dearest Maharaj. The disciples of Bhaktimarga Swami will be organizing a Vyasa Puja celebration on Monday, October 12th (the long weekend Monday) at 12:00pm at the temple. In our tradition, it is customary for disciples to honour their guru (spiritual master) on the occasion of his appearance day. Everyone is welcome to join these celebrations on Monday, October 12th. You don't need to be a disciple to attend, even well-wishers are welcome! We encourage devotees to share your "birthday / appearance day" wishes to Bhaktimarga Swami by commenting below. We will share your wishes with Maharaj! Hare Krsna! Born in 1952 in Chatham, Ontario, Canada, Bhaktimarga Swami (formerly John Peter Vis) adopted the monastic lifestyle of the Hare Krishna order in 1973. Globally known for his “Canwalk” marathons, he achieved the remarkable feat of walking across the entire length of Canada from the west to east coast in 1996 which was detailed in the National Film Board of Canada’s documentary, “The Longest Road”. Bhaktimarga Swami repeated the feat again in 2003 (this time from east to west), and yet again a third time (west to east) in 2007. Believe it or not, The Walking Monk recently finished his FOURTH trek across Canada in the summer of 2014 (Canwalk 4) which began in the spring of 2012. With this "friend-raiser", he is once again promoted pilgrimage and a more car-free, care-free lifestyle. In addition to Canada he has also walked across the countries of Ireland, Israel, Fiji Islands, Mauritius, Trinidad and Guyana. Bhaktimarga Swami is a member of ISKCON (The International Society for Krishna Consciousness) founded by his teacher, A.C. Bhaktivedanta Swami Prabhupada, and is the GBC (Governing Body Commissioner) for ISKCON Canada. 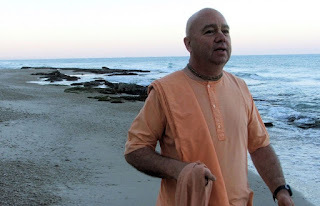 In addition to marathon walking and administrative duties, Bhaktimarga Swami is an instructor of Bhakti Yoga (devotion to the Divine) and mantra meditation. He is also a playwright, producer and director of live avant garde “morality theatre”, whose captivating works based on tales from ancient India are performed regularly across the globe. In his productions, The Walking Monk regularly engages youth from the global communities he visits in this “enter-lightenment” designed to uplift the spirit. Dearest Maharaja - I wish you all the happiest returns on your Appearance Day! You are always so kind and welcoming, and an inspiration to us all. Thank you for your endless service, and generous heart!